After looking through the photos from the Comme des Garcons show that took place today in Paris, I got the same feeling of excitement I have after a scary theme park ride: I don't know what that was but let's go again! Every time I look through the slideshow, I love the collection more and more. 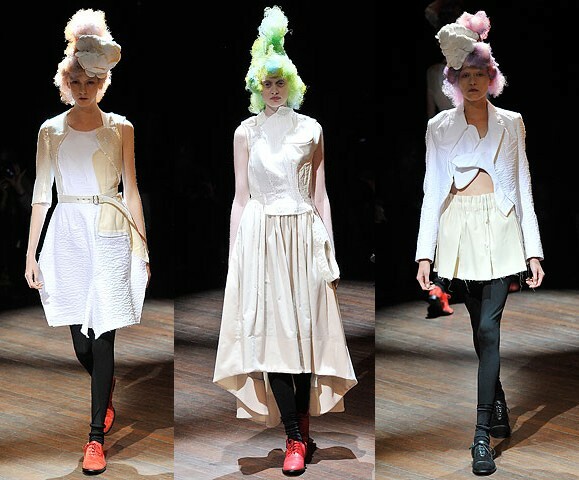 Vastly different from last season while still being distinctly Comme des Garcons, it was as if Rei Kawakubo was peeing on the fashion world and marking her territory. 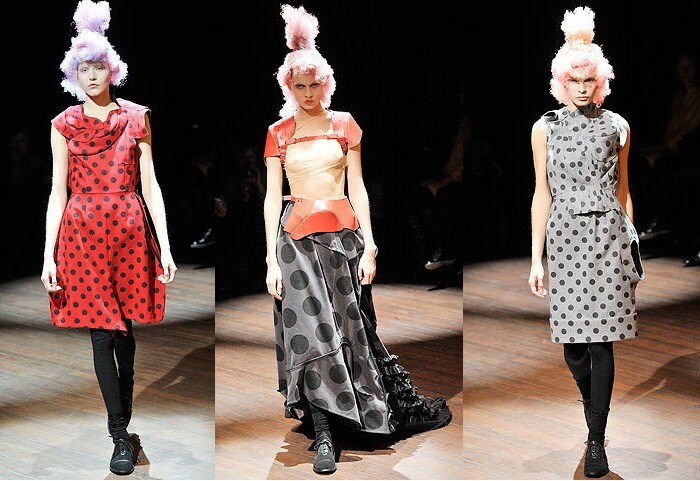 Or at least reminding us of what she started -- when did polka dots become Henry Holland's signature and military, Christophe Decarnin's? I think I can even stop complaining about Balmain now because Rei pretty much summed it up in her jackets, which consisted of tons of those tiring "Strong Shoulder" pads sewn together. Like a million little Balenciaga shoulders pieced together and worn as a top! You know what, I'm going to make that a book. A Million Little Balenciaga Shoulders. And, unlike James Frey, my story will be THE TRUTH. I'll get Nicholas to lend me a few frocks to, um, cut apart. Then I'll sew them back together. Then I'll write a book about how painful it was to physically ruin Balenciaga dresses, and the moral of the story will be, don't ruin Balenciaga dresses. And, AND, I will write it under the name TJ Reloy. I am liking this plan. Harnesses to balance out the very exposing, vulnerable nightgown-esque dresses. It seems like the majority of labels suffering due to the economy (which is...all of them) have either been little-by-little letting it get the better of their creativity, or are trying to fool us into thinking they're ~totes chill by presenting a collection where the quality lies in the styling, setting, or loudness of the show's music as opposed to the...let's see, what was the point of Fashion Week again? Oh, right, clothes. How unexpected that Comme des Garcons -- usually, a reasonably dark label -- is of the only brands to show a mildly humorous (read: not meaning gimmicky or stupidly ironic) collection this season. Even if this wasn't the collection's intention, the patch work-y tops and off-white, look-like-they-got-pulled-out-from-the-attic dresses* make me want to use the recession as an opportunity to be more creative and not an excuse to resort to the easiest ideas. 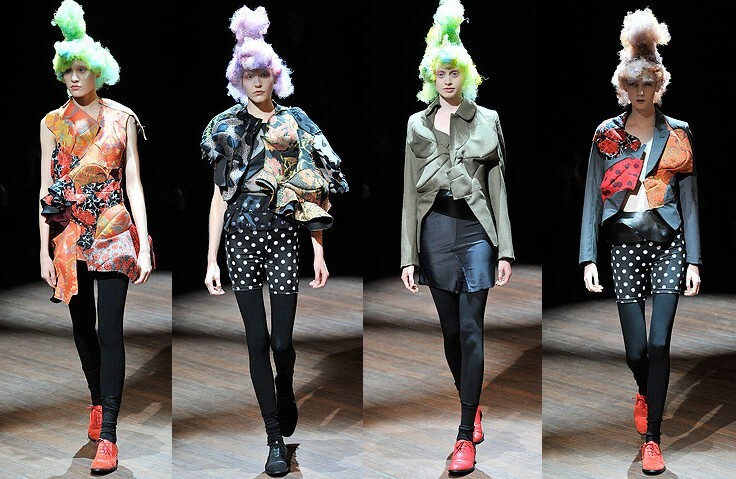 WHOA, whoa, guys, Comme des Garcons was INSPIRING for the billionth time?! How unexpected! Seriously though, the time has come to deflate the Strong Shoulder. Unless it's made out of leather steel, of course. 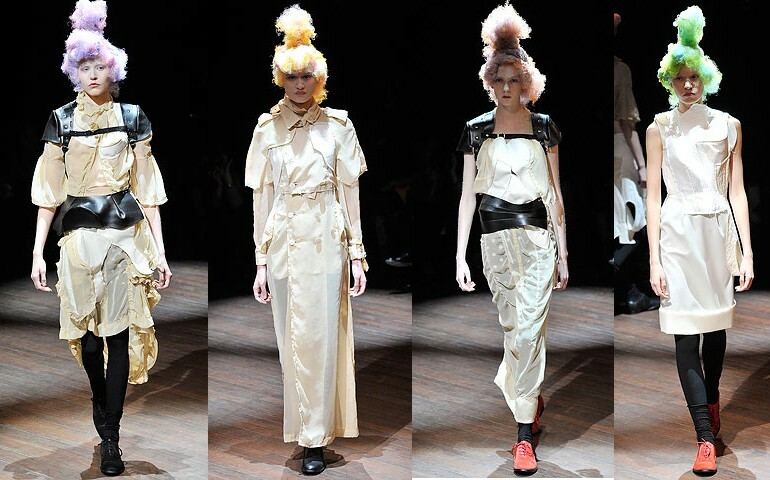 *which will look SO RAD with the yohji attic dresses!